Well, Clarice - have the lambs stopped screaming? For four years, my colleague Carl Elliott has made an extraordinary effort to help Dan Markingson’s mother, Mary Weiss, and her friend, Mike Howard, fight for justice by calling for an independent investigation of alleged psychiatric research misconduct at the University of Minnesota. During this time, many faculty members at the University have become involved in challenging university officials’ refusal to conduct a credible inquiry. Numerous faculty members signed a petition that asks Governor Dayton to establish a panel tasked with investigating Markingson’s death. Last December the Faculty Senate passed the “Resolution on the matter of the Markingson case.” Bill Gleason has for years written about Dan Markingson and pressed for an inquiry into possible research misconduct. Kirk Allison organized a campus screening of Off Label, a documentary that addresses the Markingson case. I have written to President Kaler, the Board of Regents, Governor Mark Dayton, and Minnesota’s Attorney General, and urged them to investigate Markingson’s death and related allegations of psychiatric research misconduct. University faculty – myself included – should have done more to hold senior administrators accountable. Still, there has been some dissent at an institution ruled by officials who refuse to investigate disturbing reports of possible research misconduct. Acknowledging these critical voices, I am struck by the silence of my colleagues at the Center for Bioethics. The faculty members who should have been most vocal in response to allegations of research misconduct at our own institution have remained silent. Jeremy Olson and Paul Tosto first reported Dan Markingson’s death in 2008. Elliott’s Mother Jones article, “Making a Killing,” was published in 2010. Since then, there has been extensive news coverage of alleged research misconduct at the University. During this period, faculty members at the Center for Bioethics have never had a meaningful discussion addressing Markingson’s death; the possibility that serious psychiatric research misconduct occurred at our university; and university officials’ repeated refusals to support a credible investigation. There seems to be an unspoken yet collective understanding within the Center for Bioethics that it is taboo to discuss Dan Markingson’s death and related allegations of psychiatric research misconduct. The silence is deafening. University officials have responded to Elliott’s investigative work and whistle-blowing by attempting to frame him as a lone, self-promoting, rogue employee who twists facts and uses this “unfortunate tragedy” to advance his own interests. My bioethicist colleagues have done little to counter this institutional script. Remaining silent, they have allowed university administrators to isolate, insult, and attempt to intimidate Elliott. Despite former General Counsel Mark Rotenberg’s misleading claims in reply to Elliott’s article in Mother Jones and subsequent blog posts, at no point did bioethics faculty members at the University ever challenge Rotenberg and demand credible responses. Rotenberg has made many inaccurate assertions about the Markingson case. Faculty members at the Center for Bioethics have never demanded better responses from senior university officials. 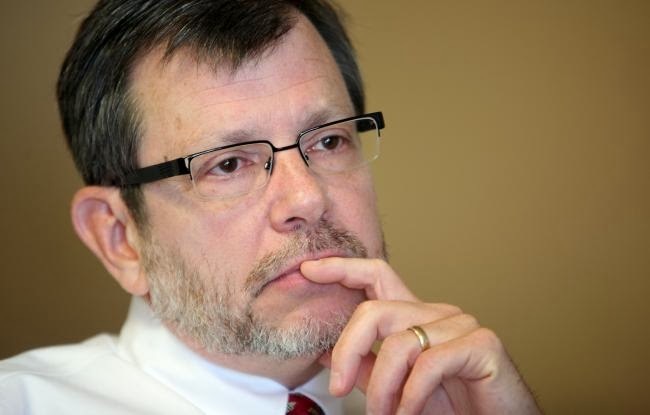 Aaron Friedman, former dean of the medical school and vice president for health services, has on numerous occasions dismissed Elliott’s concerns and supported Stephen Olson and Charles Schulz, two psychiatrists at the center of allegations of psychiatric research misconduct. In an Op-Ed, Friedman writes, “as Elliot (sic) clamors for more examination, he seems to feel no responsibility to accurately report what has already been done.” Friedman’s commentary accuses Elliott of making “unfounded accusations” and providing a “selective and distorted narrative.” Friedman’s diatribe went unchallenged by faculty members at the bioethics center. In 2011, two University Vice Presidents, Aaron Friedman and Tim Mulcahy, attended a meeting of the Academic Freedom and Tenure Committee and explored ways to silence or challenge Elliott. They were there as a question former General Counsel Mark Rotenberg posed at another committee meeting. “What,” Rotenberg had asked, “is the faculty[’s] collective role in addressing factually-incorrect attacks on particular University faculty research activities?” Minutes from the meeting suggest that the purpose of the vice presidents’ time with the Academic Freedom and Tenure Committee was to explore ways of restricting Elliott’s academic freedom and sanctioning him for making what they alleged were inaccurate claims. I was the only one of Elliott’s colleagues from the Center for Bioethics to attend the committee’s next meeting and ask whether Rotenberg’s comment was a dog whistle call to restrict Elliott’s academic freedom. While Karen-Sue Taussig, an anthropologist, and philosophers Valerie Tiberius, Ken Waters, and Naomi Scheman attended the meeting and offered robust support for Elliott’s academic freedom and right to call for an investigation, despite the principles at stake there was no additional representation from the Center for Bioethics. Even when directly asked to investigate, faculty members at the Center have refused to address allegations of psychiatric research misconduct. Debra DeBruin and Steve Miles have both served as directors of the University’s clinical research ethics consultation service. Despite being requested to conduct an inquiry into Markingson’s death and examine the adequacy of human subject protections in the Department of Psychiatry, both DeBruin and Miles refused to investigate. The only exception to the collective silence at the Center for Bioethics has been single letter that was sent to the Board of Regents. 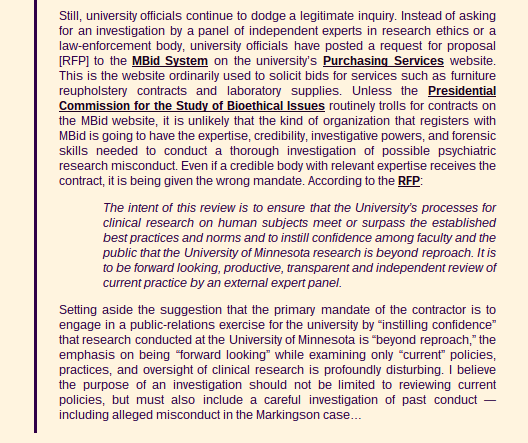 In November 2010, eight faculty members wrote to the Regents and called for an investigation of the Markingson case. Notably, however, Jeffrey Kahn, then the director of the Center for Bioethics, did not sign the letter. Debra DeBruin, then the associate director and now director of the Center for Bioethics, did not sign the letter. Steven Miles and Susan Wolf, two of the Center’s most senior and prominent bioethicists, did not sign the letter. Throughout a serious research scandal, bioethicists who claim they are concerned with justice, protecting the vulnerable, and responsible governance of human subjects research have remained silent. It takes little insight into the power structure of the University to understand why faculty members at the bioethics center remain silent. Anyone paying attention to President Kaler, former Vice President Aaron Friedman, former Vice President Mulcahy, former General Counsel Mark Rotenberg, and current General Counsel William Donohue would have noticed that senior officials all dismiss calls for an investigation of psychiatric research misconduct. To publicly call for an investigation is to swim against the institutional tide. It is much easier to keep quiet than to confront the university’s most powerful administrators. When does remaining silent during a research scandal lead to complicity in wrongdoing? Will collective silence from bioethicists prompt blunt questions concerning why the University of Minnesota has a Center for Bioethics? Might collective silence diminish bioethics as an area of study by suggesting that bioethicists, when confronted with allegations of misconduct at their own institution, do little more than defer to authorities? What happens if an investigation at some point determines that serious research misconduct has occurred at the University of Minnesota and most bioethicists at the Center for Bioethics here said and did nothing rather than confront wrongdoing? Contemporary bioethicists look at the Tuskegee research scandal and question why so many individuals chose to remain silent in the face of wrongdoing. “It was a different time, a different place,” we say, and congratulate ourselves on the progress we assume we’ve made. We look at the past and we think we are distinguishable from people who responded to injustice with silence and indifference. But doesn’t the silence of those who have voices and could choose to use them for good bind past to present and connect us to what we thought we had surpassed? 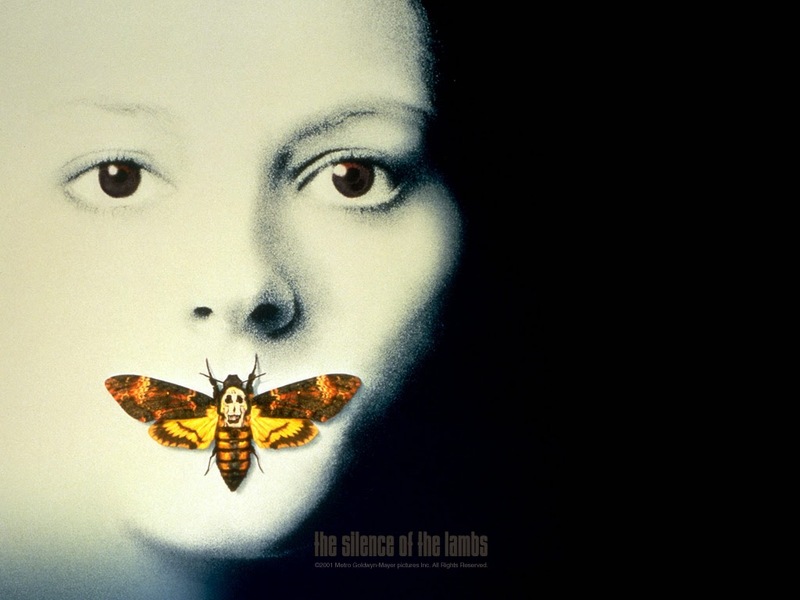 “The Silence of the Bioethicists”, an earlier version of this post, appeared March 24, 2014 on the blog, Impact Ethics. ...the university violated the state’s Human Rights Act prohibition of discrimination against a person on the basis of sexual orientation. [The judge] awarded Brenny a maximum of $334,000 for lost wages based on the university’s conduct, plus another maximum of $25,000 for mental anguish. He said he hopes the U has corrected the problems his daughter faced or is at least working toward a solution. And what did the University of Minnesota have to say about losing this discrimination suit? Not "We are very sorry." Not "This never should have happened." Not "We will be taking steps to see that this does not happen again." 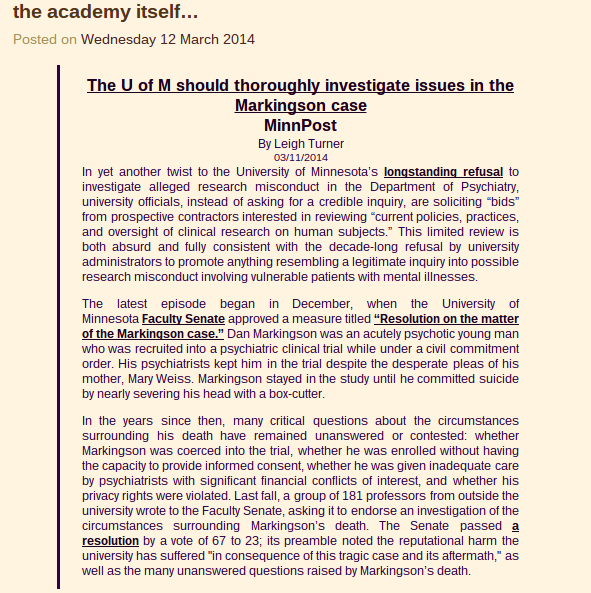 My colleague Leigh Turner has written a piece for Community Voices on MinnPost entitled: "The U of M should thoroughly investigate issues in the Markingson case." 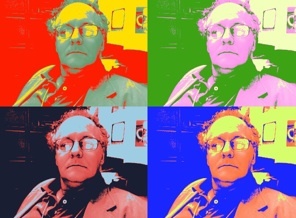 Dr. John Nardo, aka 1 Boring Old Man, subsequently posted the following piece on his most excellent blog. Bioethicist Carl Elliot’s twitter post sums it up: "Bizarrely, the ‘Resolution on the Matter of the Markingson Case’ will exclude the Markingson case." The university administration has resisted any serious investigation of this case for a decade, and is making a mockery of the insistence from its own faculty – adding yet another senseless twist to this already convoluted tale [as if it needed any more]. Markingson was enrolled into this volunteer study to avoid involuntary hospitalization. So long as he cooperated and took the assigned medicine, he could stay out of the State Hospital, yet the outcome measure was how long the patients continued the medication [voluntarily]. In spite of the reports that he was doing fine, at the end of six months, his commitment was extended for another six months [the duration of the study]. Not long after this extension, he killed himself in a dramatic way. Unlike the usual complaints of over-medication and unnecessary restraint, Markingson was inadequately medicated and placed in an environment that did not offer appropriate restraint. The magnitude of his impairment was neglected in the service of the clinical trial – an unnecessary trial of the expirimercial variety. The absurdity is that until he killed himself, he was on the road to being declared a treatment success since he was still taking the study medicine [albeit anything but voluntarily]. In a more reasonable world, one would expect the Sponsor [AstraZeneca], the Principle Investigator [Jeffrey Lieberman, current APA President], and the organization actually running the trial [Quintiles] to have some interest in knowing what went wrong in their study. If the story is actually as I have just told it, it is an example of clinical neglect leading to a fatality in the service of performing an unnecessary clinical trial for marketing purposes. At this point, only an outside, unbiased investigation can determine the truth. The Study Coordinator has already been censured by her professional organization for her part in the story, but the University administration has hindered any further general probe. This current tack of limiting the investigation to current conditions, leaving Markingson’s out of the investigation, and putting it out for bidding along with office furniture on a request for proposal site can only be seen as deliberate obstruction of the faculty senate mandate – and a direct insult. U administrators have offered alarming speculation about potential tuition hikes. Legislators questioned University of Minnesota administrators about the school’s request for state funding and its impact on tuition, the Minnesota Daily reported last week. Members of the House Higher Education Committee asked how the University would respond if its $233 million request isn’t fully met. 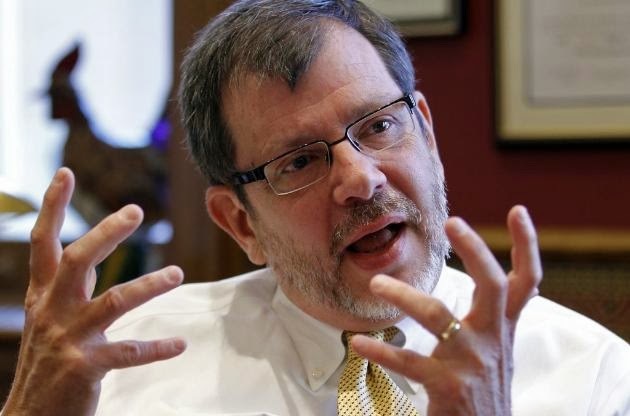 University President Eric Kaler vaguely said tuition would be affected, while University Chief Financial Officer Richard Pfutzenreuter mentioned a 1 percent hike, not necessarily for undergraduates. This rightfully alarmed some representatives and raised concerns that the University was backpedaling on its two-year in-state tuition freeze, which was a huge part of last year’s request. We took it seriously, too. It might be difficult to predict the University’s financial situation in response to low state funding, but raising undergraduate, out-of-state tuition should be off the table. Kaler and Pfutzenreuter’s unwillingness to take a firm stance on this undermines the point of the freeze in the first place. While we support the freeze wholeheartedly, tuition hikes are hitting graduate, professional and out-of-state undergraduate students as hard as ever. The University froze tuition in exchange for full state funding last year. That fact doesn’t invite outsized increases for other students, nor does it make leveraging graduate and professional student tuition a viable option for the University at the Capitol. Ideally, students should represent a shared responsibility for both this institution and the Legislature. However, they can easily become a bargaining chip. Given the tuition increases that the University has discussed, we hope the conversation doesn’t continue in that direction. A University of Minnesota professor accused of child exploitation has been arrested. FBI Special Agents arrested Woody Dale Branton, 62, of Minneapolis, without incident at his home Friday. An arrest warrant had been issued for Branton out of the Western District of Louisiana for offenses pertaining to child exploitation, allegedly involving a 15-year-old girl. Branton made his initial appearance in Federal District Court on Friday. He has been with the U of M since 1988. He is an Associate Professor of Neuroscience, but has not been teaching this semester. The university is reviewing Branton's employment status, according to Chuck Tombarge a spokesperson for the U of M.
Minnesota Public Radio News reports court documents say Branton will be kept in custody for a detention and removal hearing set for Wednesday in St. Paul. Poverty. Social inequality. World hunger. Climate change. Disease. Religious intolerance. Those are among the most serious and intractable problems we face. They are among our world’s Grand Challenges. Few organizations have the historic mission or the public charge to confront such challenges. Few institutions are allowed the intellectual freedom and curiosity to attack such challenges from every angle—be it cultural understanding, public policy, historical perspective, or science. Few universities have the expertise across a range of disciplines, the resources, or the ambition to solve such challenges. But we do. And because we do, the State of the University of Minnesota is vibrant, filled with ideas, and fueled by boundless human energy. Our University overflows with unique promise, which drives the economy, culture, and innovation of the state of Minnesota. The world’s Grand Challenges are ours—all of ours. And I want this University to be known as a leader in meeting those challenges, in our teaching, in our curriculum, in our research, and in our diverse approaches to public engagement. Students, faculty, staff, alumni, donors, community partners—no matter how different each of our perspectives may be, I believe together we will continue to move this University forward because we share a belief in the principles that underlie our work. And civic responsibility to be a guiding force to meet those Grand Challenges. We have every right and many reasons to be proud of the University of Minnesota and to be excited about the future—from Duluth to Rochester and from Crookston to Morris and the Twin Cities. And I’m about to tell you why. But, first, allow me to acknowledge some key members of the University community. I’d like to thank our Board of Regents for standing strong, accountable, and active in supporting the U and me as, for example, we partnered with the State of Minnesota to enact a two-year tuition freeze for Minnesota resident undergraduates. Board Chair Rick Beeson, Regents Laura Brod, Linda Cohen, and Tom Devine, would you please stand? Regent Patricia Simmons in Rochester and Regent David McMillan in Duluth, thank you for joining us electronically. You can stand, too, if you’d like! To all of our Regents who couldn’t be here today, thank you for your thoughtful guidance and wisdom. I am lucky to have you as my bosses. Leaders of the University Senate and the students, faculty, and staff in governance, thank you for joining us here today and for your service to the U. And thank you to the many students and faculty from UMD who have travelled to the Twin Cities for Bulldog Day at the Capitol and for joining us today. Also with us today are Minneapolis City Council member Andrew Johnson amd representatives from Senator Franken’s and Congressman Ellison’s offices. Thank you for your support of the University, and for being our partner. And I want those partnerships to deepen. I’m also delighted to welcome a number of new members of our senior leadership team. Vice President for Equity and Diversity Katrice Albert, Vice Provost and Dean of Students Danita Brown Young, Medical School Dean and Vice President for Health Sciences Brooks Jackson, University of Minnesota Foundation CEO Kathy Schmidlkofer, and University of Minnesota Alumni Association CEO Lisa Lewis are here today. Since I became President 31 months ago, we’ve seen a remarkable rejuvenation in the University’s senior leadership team, with three-quarters of our leaders either new to the U or their jobs. They bring fresh ideas, new energy, exceptional leadership, and, you should know, lots of opinions! We could not do this work without a great team, and a great team of deans. Finally, I want to thank my wife, Karen Kaler, who has been trying to make me a better person for 34 years now. I have seen some progress, but I think she’s still waiting! Two and a half years ago, in my inaugural address, I urged people to—quote “pick up the pace.” It raised a few eyebrows. It caused a little bit of squirming in seats. I’m happier to say it also triggered many nods of approval among those of you who had grown impatient with higher education’s inertia, in general, and ours, in particular. Change may feel slow here, but we have picked up the pace, and I thank all of you. For one, we have changed the nature of our conversation with state leaders and the citizens who elect them. The result is a solid reinvestment in this great University after nearly a decade of cutbacks. Besides achieving that historic tuition freeze, we infused new energy and resources into our research enterprise through the Minnesota Discovery, InnoVation and Economy initiative—or MnDRIVE—a four-legged research platform that seeks to solve some of our state’s and the world’s most intractable Grand Challenges. Internally, we are making significant progress on Operational Excellence, one of my top priorities since taking office and continuing today. Let me tell you, we are aggressively tackling administrative costs. A few months ago we pledged to redirect $90 million from administration to our core mission activities over the next five years. And this fiscal year alone, we’ve achieved cost savings by streamlining purchasing, with energy conservation initiatives, and by increasing administrative efficiencies. We will hit our $15 million reallocation goal this year, and I’m confident that we will also do so in the years to come. We have had many successes, and I urge you to read about them at Excellence.UMN.edu, and you can also make suggestions there. On another front, the Enterprise System Upgrade Program is changing work streams across our core administrative areas, including student services, human resources, and finance. I thank the entire ESUP team for its remarkable success around what is truly a complicated set of processes. Meanwhile, our new employee engagement initiative got off to a great start with a 57 percent response rate from all of you. That’s the highest response rate ever for a University employee survey. Overall, our employees are highly engaged—you believe in our mission and want to build a career here. But some faculty and staff are frustrated with obstacles in the way of getting their jobs done. Some days, I’m one of those! As we move forward we will remove barriers, improve productivity, and enhance your work environments across the University system. Our goal is to provide the workplace environment that allows you to do your jobs even better than you already do. We have many other examples of improving and revamping without adding costs. For instance, the new Center for Educational Innovation, which will do exactly what it says. And last month, we created the Office of University Economic Development, to better define our role as the state’s economic engine and to reach out to partners in the business and entrepreneurial communities. All of these changes—and many others—are driven by our mission to teach better, conduct research more freely, and to engage more effectively with our communities. What else have we accomplished? Lots and lots, and let me quickly mention just a handful. As our Extension continues its important work across the state, we have strengthened our relationship with the agriculture and agribusiness communities. We’re intentionally supporting new synergies between CFANS and CBS to support this important industry. Our students continue to be internationally recognized, such as Katrina Klett, who was awarded a coveted Truman Scholarship this year, an honor that recognizes a handful of undergraduates nationwide who are committed to being “change agents.” Her spectacular achievement? Establishing beekeeping in five rural villages in western China, combining her language skills with her environmental science knowledge. Katie is with us today, and I’d like to recognize her. Our system campuses have raised their profiles and identity—all being recognized nationally for their distinctive characters. At Duluth, 22 students made history. They belonged to the first Master of Tribal Administration and Governance class, the only graduate degree program in the U.S. that trains people specifically in the best management practices for tribal governments. We celebrated Rochester’s first-ever graduating class, and the campus received national accolades in Forbes magazine—believe it or not!—for its innovative approach to teaching and tenure and its unique relationship with the city of Rochester. Crookston was again named to the President's Higher Education Community Service Honor Roll for 2013, and it was named by U.S. News as the No. 1 best public regional Midwest college. And Morris’s commitment to sustainability and affordability landed it on the list of the Greenest Universities in the nation, and, just this week, was named by Kiplinger's as among the nation’s best values for a college education. I’d call that an academic quin-fecta, and only we achieved it. Our Twin Cities College of Design established its “Degree in 3” pilot program, which I encouraged in my State of the University speech two years ago. It lets students earn their degrees in less time, enabling them to enter the workforce or pursue a graduate degree more quickly. Increasing philanthropy is one of my top priorities and support among friends of the University has been extremely encouraging. In a little over half of our fiscal year, we’ve raised nearly 80 percent of our goal, and we’re likely headed for a record year by our University of Minnesota Foundation. Philanthropy is critical to supporting students and faculty research. And our Alumni Association is implementing its strategic plan to more fully engage all 440,000 alumni—like me and many of you—across the world to be stronger advocates for our students, for each other, and the U. Meanwhile, we are a month away from reopening Northrop, an iconic structure that stands as testament to our commitment to the arts, humanities, and interdisciplinary education. Yes, we’ve accomplished much in the past year. Let me turn now to graduate and professional education. We excel in undergraduate education across our system. But the signature of a research university is graduate education. One of my first budget actions as president was to invest 6 million dollars over three years to Doctoral Dissertation Fellowships. This has been a success, helping students complete their degrees more quickly and—I dare say—with higher quality. I am pleased to announce today that I am renewing that support for an additional year, 2015. These are critically important fellowships for the next generation of world-class scholars, and I will make further investments consistent with the outcome of the strategic planning work. The other pillar, of course, of post-baccalaurate education is professional education, and here the University stands alone in many disciplines in providing the state with trained professionals. Our AHC leads the way in interprofessional education for health care providers, where doctors, nurses, pharmacists, and others learn to work as a team to provide care. And our Law School impressively serves the common good in many ways, including the responding to the needs of Minnesota’s diverse immigrant groups through its recently formed Center for New Americans. That was funded with a generous gift from the Robina Foundation. But make no mistake. Professional schools face enormous challenges in maintaining excellence and affordability. And those challenges are among the most important we face as an institution. As we have done to support our undergraduates, I hope to explore opportunities to partner with the State of Minnesota to educate and retain these professionals, particularly in underserved areas of Minnesota. Which leads me to other challenges we face amid all that we’ve accomplished. Last week, with the convening of the legislative session, we turned our attention to the Capitol seeking support from Minnesota lawmakers to upgrade our facilities so that students learn and faculty teach and research in 21st-century buildings. The request contains important funding for maintenance and renewal across the system, new buildings for science and teaching in Minneapolis, St. Paul, and Duluth, and a wellness center in Crookson. I urge all of you to take seriously our roles as advocates for the University, and to raise your voices, and please be sure to join our Legislative Action Network. Another urgent challenge is ensuring that our University population mirrors the racial and cultural diversity of our state and nation. Advancing equity and diversity is a priority of mine, but we need to do better. This year we expanded the Presidents Emerging Scholars program that serves primarily first-generation and low-income students, and the offices of Equity and Diversity and Admissions are redoubling our efforts to recruit and enroll more diverse students. We launched a new initiative—called Retaining All Our Students—to help ensure low-income students successfully transition from their first to second year of college. However, despite this work and our clear commitment, our record is alarming on attracting and retaining students of color—particularly African American men. The number of African American students on our Twin Cities campus is fewer than 4 percent. And among African American men, that percentage is lower. We need to redouble outreach to these students and showcase academic opportunity. We also know that for many of our students of color on the Twin Cities campus, the environment could be more welcoming. Students have said they sometimes feel singled out as the only student of color in a class, and some feel profiled by others on campus because of their race. To more proactively address these issues, we recently convened senior leaders—from my office, Equity and Diversity, the Provost’s office, Human Resources, University Services, and Student Affairs—to develop new strategies to improve campus climate. Each system campus is also attentive to these issues. With our new Campus Climate Workgroup, I look forward to seeing new initiatives this spring and next fall and I am prepared to provide the resources this team needs to implement their plans. One especially big challenge we’ve faced this past fall on and around our Minneapolis campus is an increase in crime. Over the past decade, public safety here has significantly improved, with incidents dropping by half. However, this fall we saw an uptick in robberies, primarily in the neighborhoods near campus. Let me be clear, the numbers are relatively small, an increase of 7 incidents over an average of 27 for these months annually, with all but three of those total incidents occurring off campus. We know that our students, their parents, legislators, and the public do not distinguish between on- or off-campus, and neither do I. But it is a huge distinction when it comes to police response, follow-up, and investigation. Our UMPD officers don’t have jurisdiction off our campus. Those are not our investigations or streets to patrol, and yet we need to make sure our students are safe. To that end, we’ve put into place an aggressive public safety initiative called Safe U. The Board of Regents supported our plan to reallocate $4.1 million to add lights and security cameras, and secure buildings. We’ve hired more police officers and student Security Monitors and have funded overtime hours for our officers. And our partners in Minneapolis have added six additional officers, with a seventh to come soon, in the Second Precinct where many of our students live, and I am grateful for that. Our students have gotten deeply involved in addressing public safety, and I thank them. Everyone who works, studies, lives or visits our Twin Cities campus every day—all 80,000 of us—must be safe and feel safe. This public safety challenge has underscored a pressing reality, and that is a compelling need to be a more engaged institutional citizen and partner with the City of Minneapolis and our neighborhoods. For too long, we at the University have seemed not to care about development surrounding our Minneapolis campus, which I believe has attracted at least some of the crime we’ve experienced. In the neighborhoods around campus, 7,000 new housing units have been added recently and another 7,000 are in the pipeline. This means a higher concentration of students living near campus than ever before. It means that the distinction between “on campus” and “off campus” has become blurred. And these changes mean our neighborhoods have different needs today than in the past. For example, walkability, bikeability, and a range of amenities are important to neighborhood livability for our students and they need to be important to the institution. We must be a more proactive, engaged, and thoughtful neighbor. Over the next few months, we will forge a new set of guiding principles for working with the City of Minneapolis and our neighborhoods. I expect to bring our new approach to the Board of Regents for their information in June. The good news is that this stepped up relationship with our community dovetails perfectly with a key direction of our Strategic Planning process. And that’s where I want to turn now. To complete Strategic Planning on our Twin Cities campus is my top priority for this year. It is a plan that will align and be integrated with the directions of our system campuses. When we launched this effort last summer, I laid some foundational directions. First, I wanted this plan to be bold and focused, to be developed thoughtfully but in a timely fashion, and, most importantly, to be ambitious. If it wasn’t ambitious, then it wasn’t going to be strategic enough for me. I must tell you, I am very pleased and excited about the direction the Strategic Plan, under Provost Hanson’s leadership, is taking us. For one, it has been faculty driven, and that’s extremely important, but staff, student, and stakeholder voices are there, too, through membership in the Strategic Planning Workgroup, online surveys, a campus conversation, and focused discussions. With the permission of the Workgroup, I’d like to share with you the directions in which we’re headed. The group has established a set of four strategic and overarching initiatives, strategies that will establish incentives to empower faculty and staff to excel at what they do every single day. These emerging initiatives are, frankly, inspiring, and I want to spend some time on them with you. The primary goal of the Strategic Plan is how I began these remarks: That we as a University become pre-eminent in solving the Grand Challenges of a diverse and changing world. To do that, we will hold ourselves and each other accountable and set the bar high. This is one of four emerging strategies: that we will support excellence and, with intention, reject complacency. The University of Minnesota should not be a place to feel self-satisfied with the status quo. There is no room for contentment when we confront critical internal and external challenges. The faculty and staff on the Workgroup who have driven this strategic planning process want us to be exceptional. I want us to be exceptional. Students and their parents want us to be exceptional. And our community wants and demands that we be exceptional. So let’s set—and then reach—that goal. Rejecting complacency, however, will only get us part of the way there. Another strategy, therefore, is to recruit and retain field-shaping researchers and teachers. There is no great university without world-renowned faculty, with the highest recognition and whose creative work defines their field. But we also must face this reality. Forty-one percent of our faculty members on the Twin Cities campus are 55 or older. In the next decade or so, we could be saying goodbye to many of our most valued and productive colleagues. While their loss will be real, it is also a great opportunity for renewal. We need to be proactive about attracting faculty of the future and be mindful that the world’s best young scholars will only come to a university that is vibrant, cutting edge, and diverse. So we are committed to hiring, welcoming, nurturing, and promoting the best faculty—faculty who will lead this institution into the future. Another emerging strategy for the Strategic Planning Group is to ensure that the Twin Cities campus embraces what the Workgroup is calling “a culture of permeability.” I call it, simply, leveraging our location. The Twin Cities campus is in the 16th largest metro area in the nation, with one of the country’s best economies, in a region regularly considered the healthiest to live, in a place with 19 Fortune 500 headquarters, in a theater, arts, and culture mecca, and with one of the world ‘s great rivers that flows the entire length of the country. This is an incredible place to live. This is an incredible institution. Better leveraging our location simply makes sense, for both us and our community. Pragmatically, it means, among other things: more internships and eventual employment for our students, and even more research to tackle the state’s and metro area’s achievement, employment, and opportunity gaps. And that’s just the beginning. At its core, we seek to educate, cultivate, and empower leaders to foster institutional and societal change. And to do that, our curriculum must change. We should lead in developing courses and degree programs that equip our students to tackle the Grand Challenges that rarely fall in a single discipline. So, let me tell you a story about what could happen here in the future. 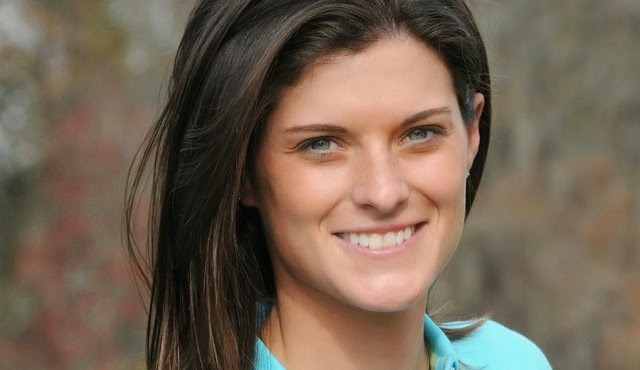 A young woman grows up in Wayzata, surrounded by neighbors in banking, finance, and non-profit management. She thinks she wants to follow in her parents’ footsteps and lead a company. She is a very good student, so she’s admitted to the U and the Carlson School, but among her freshman classes is English 1401-W, “Literatures of the Third World.” In this class, she is introduced to authors she didn’t know, stories she’d never heard, and ideas she’d never considered. Something clicks. She’s realizing she really must improve her writing, all the while learning about ways of knowing and being that she had never considered. She’s learning that being a business leader isn’t just about balance sheets and income statements. It’s also about clear communication, critical thinking, leadership, and curiosity. And she discovers that—even more deeply in her sophomore year—when she takes a class at the Carlson School called Management 1005, “Corporate Responsibility and Ethics.” She is assigned the essay question—and this is not imaginary, but an assignment in 1005 this very spring—“Copper Nickel Mining in Northeastern Minnesota.” She becomes fascinated by the ethical issues that impact job creation, the environment, human rights, and regional economic development. She sees a Grand Challenge across disciplines, across colleges. Multiply that story by 7,500 graduates each year, and that is the impact this great university can have on the world. And that is the evolving vision for a new Grand Challenges curriculum, and that is how our Twin Cities campus Strategic Planning process is unfolding. And I thank the Workgroup members for their exceptional work so far. They’re not done … yet. A final plan should be in place by the end of September. This is bold. This is relevant. This is invigorating, and it’s the kind of critical thinking and engaged learning and research that our graduates—and their future employers—are seeking. I do want to close with this thought. As we continue to change and evolve, we must not ignore the lasting legacy this University owns across the state and around the world. We should celebrate the incredible potential we hold in our hands because of this coalition of scholars, community leaders, and the thousands of young people with dreams and solutions. I want this University to have a Grand Ambition and apply that against our many Grand Challenges. Let’s do that work together.